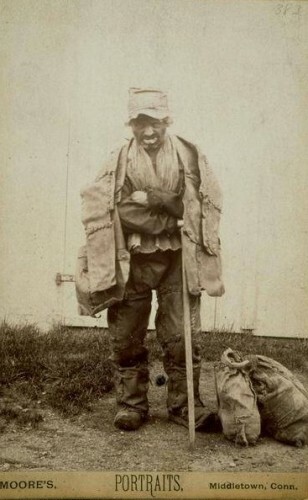 On March 20, 1889, the Old Leatherman, so called for the clothing that he fashioned for himself, is thought to have died. A folk legend and restless traveler, the Leatherman devoted each day to walking a never-ending, clockwise circuit through southwestern Connecticut and adjacent sections of lower New York State. Legend has it that his journey covered 365 miles and took 34 days to complete, at which time he would start again.